Yes, I am wearing a Penguins jersey. Why do you ask? 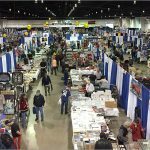 This past Friday and Saturday I went to the Chicago Sun-Times Sports Collectibles Convention. Apparently it was the “46th Annual” show, but this show happens twice a year and sure has hell has not been going on for 46 years. I don’t pretend to understand the show’s numbering system, but I do look forward to this twice-annual show like a pilgrim looks forward to a religious sojourn. I found this 2003-04 Topps C55 Mini Marc-Andre Fleury RC for 50 cents at the show this past weekend. The show started on Friday at 4:30 pm. Several tables were empty, since some dealers don’t even bother to set up for the few hours on that night. Not many buyers showed up, either. The convention space is huge, but it felt empty and there was little energy or enthusiasm from the dealers and the attendees. In fact, some dealers started packing up an hour early. Saturday was a different story. It was crowded and a lot of dealers seemed happy with the foot traffic. The show goes from 9 am to 5 pm, and I was able to do a lot. I hung out with my favorite hockey couple, Diane and Paul Bogar. 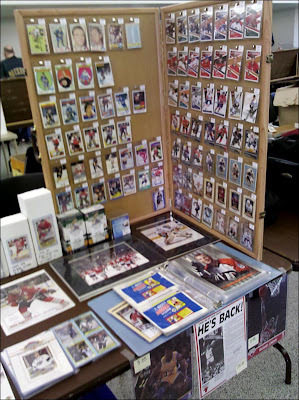 Diane and Paul are dealers from Ohio who sell only hockey cards and hockey memorabilia, and specialize in oddball items, photos and books. I got some vintage hockey paperback books from the 1970s. 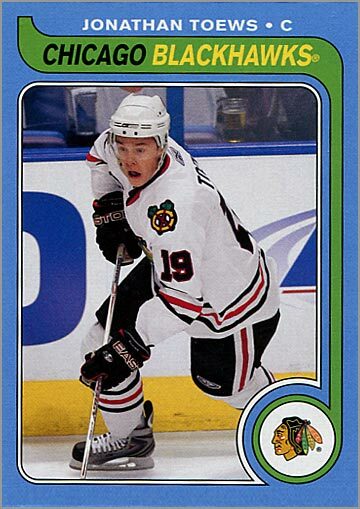 One of the highlights of every “Sun-Times” shows is meeting up and trading cards with other local bloggers. I met up with Tim (a.k.a. DFG), Sean and Nick B., traded cards and talked hockey for a bit. 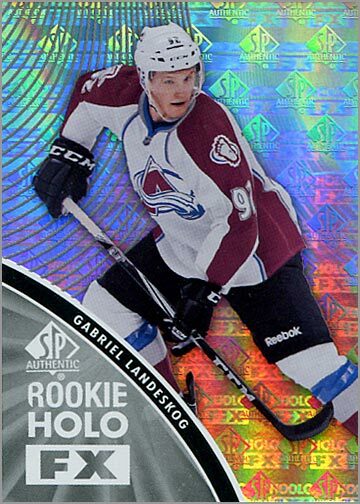 Tim later bought some boxes and got a couple of good cards that I’m sure he will brag blog about. I <3 inserts from the 1990s. 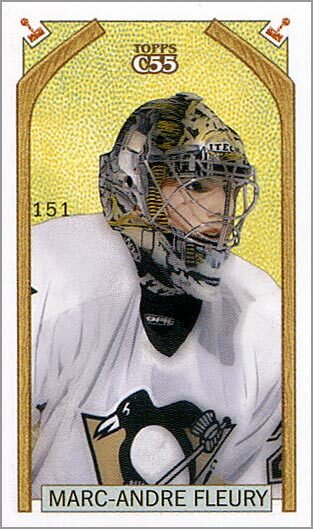 A 2003-04 Topps C55 “mini” Marc-Andre Fleury RC. 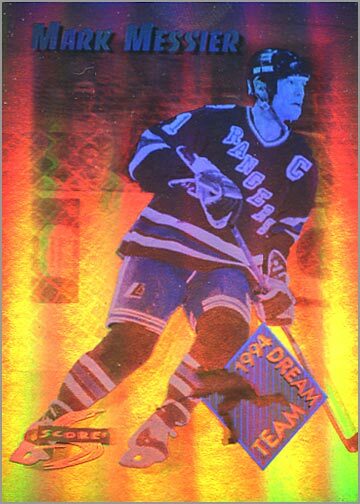 I normally get outbid on eBay when I try to buy this card, so it was pretty awesome to find it for 50 cents. Another great find for 50 cents. But back to the group photo for a moment. 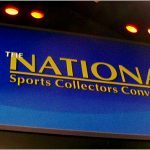 I spent some time hanging out and talking with Scott and Frank, co-owners of one of my favorite card shops, AU Sports Memorabilia in Morton Grove, IL. 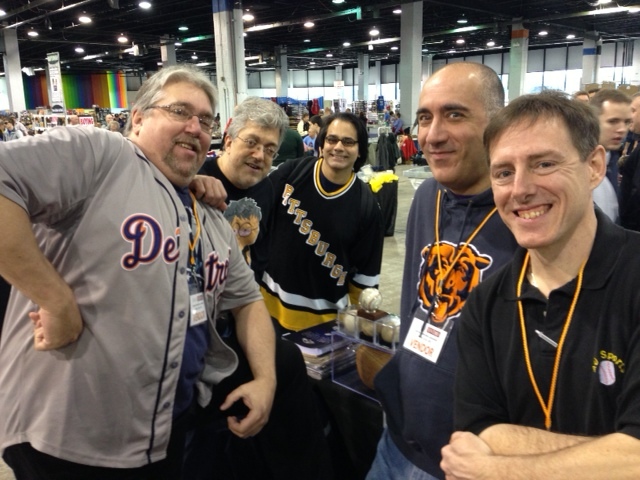 One great thing about going to a card show for 2 or 3 days (instead of just 1) is that you actually have time to socialize with others who enjoy the hobby. From left to right is Scott Beatty (co-owner of AU Sports), John (blogger who writes the Johngy’s Beat blog), me, Frank Caputo (co-owner of AU Sports) and Brian O’Donnell (who sells vintage programs at shows). Photo by Dan of Memory Lane. Someone also asked me why I was wearing a Penguins jersey. 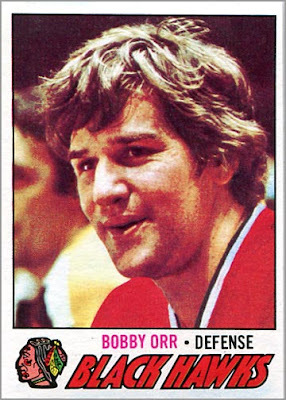 I replied “because it’s awesome.” I will wear my Blackhawks jersey to a Blackhawks game, but when I go to card shows I mix it up and wear jerseys from other teams–the more offbeat the jersey, the better. Stay tuned. I have some vintage goodness to show off over the next couple of days. I was debating going to this since I had just gotten back from Phoenix on Spring Break and was quite tired. 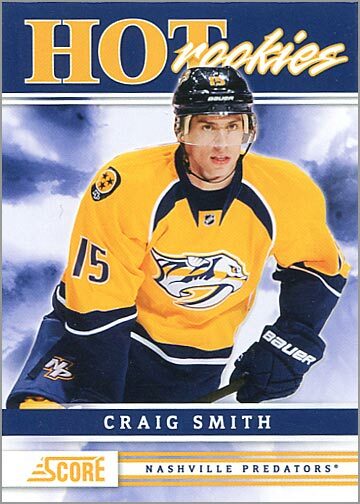 I was think that these were small and don’t have much hockey at them so I am just going to wait till National in in August and the Blackhawks Convention in July.